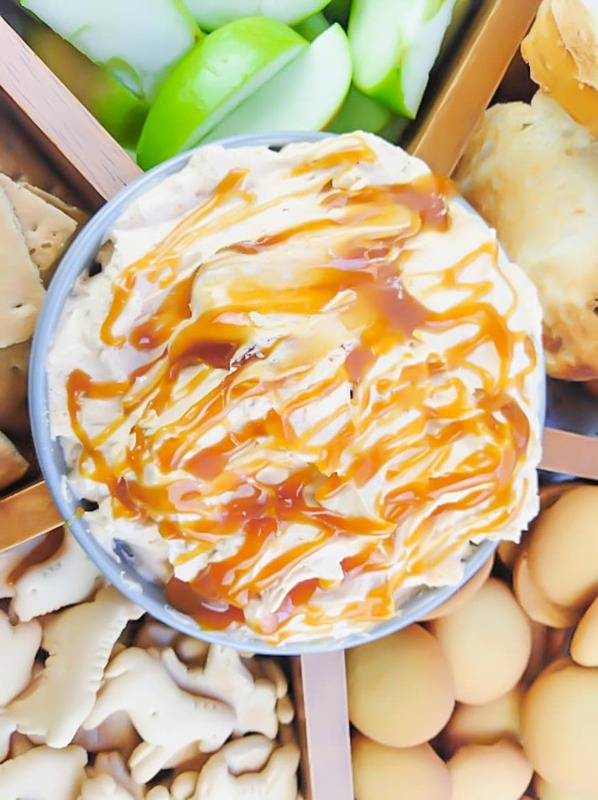 This pumpkin cream cheese dip is light, feathery, and drizzled with delicious caramel! 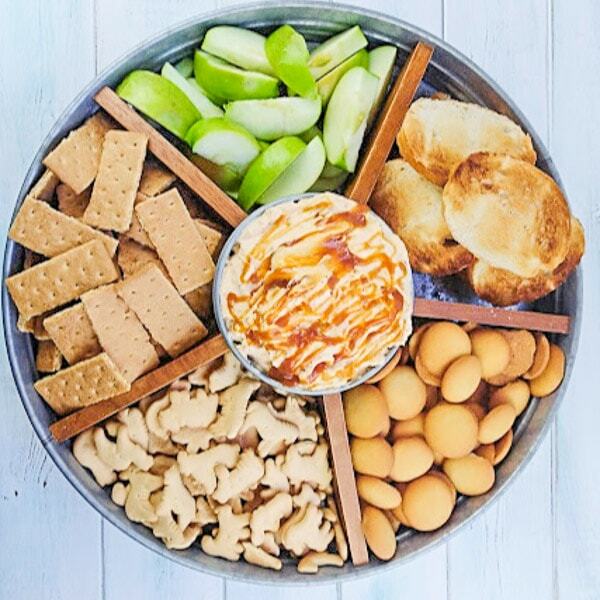 It’s perfect for dipping fresh fruit, vanilla wafers, graham crackers, and well, really almost anything sweet! 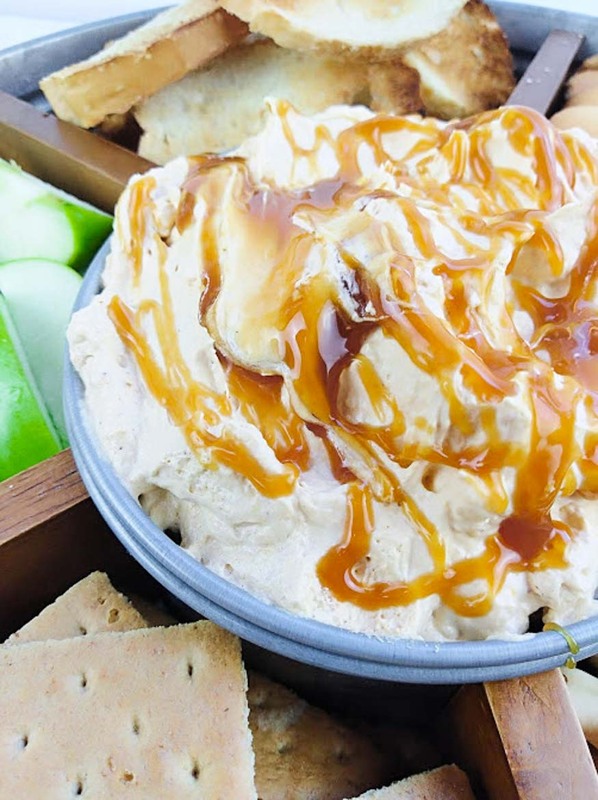 I really love simple dips like this, but you can also fill out your snack table by adding a healthy chocolate Greek Yogurt fruit dip, a Greek yogurt fruit dip recipe made delicious with honey and peanut butter, a cream cheese caramel apple dip, or a savory easy taco dip. Yum! This recipe is provided by a guest author for The Parent Spot. Add caramels and heavy cream to a medium saucepan. Cook on low, stirring constantly until they’re combined. Cool 15 minutes. You can also microwave on high 30 seconds at a time, until melted, stirring every 30 seconds to combine. Mix cream cheese until light and fluffy in a medium bowl. Add pumpkin, brown sugar, vanilla, and pumpkin pie spice. Stir until combined. Fold in the Cool Whip, using a spatula. Now, you’re ready to assemble the dip! Add 1/2 of the dip to a serving dish, and drizzle with 1/2 of the caramel sauce. Top with the other 1/2 of the dip, and drizzle with the remaining caramel sauce. Serve with fresh fruit, graham wafers, crostini, vanilla wafers and animal crackers. 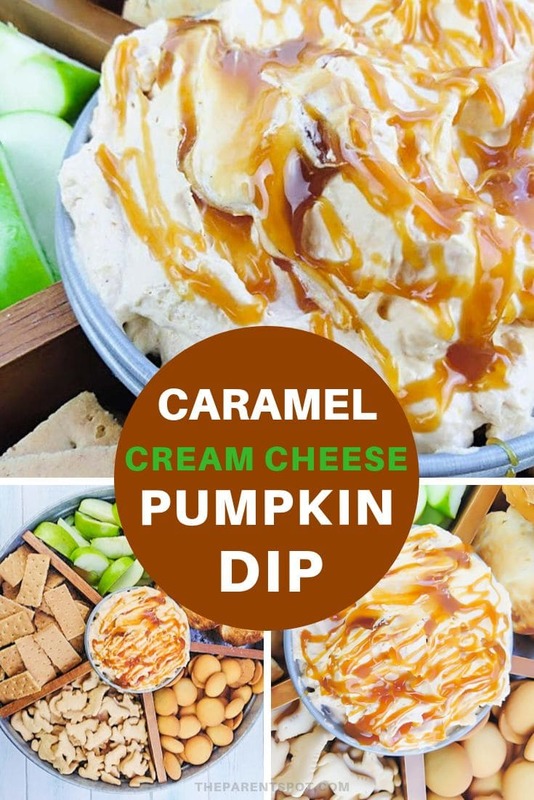 What to dip in pumpkin dip? If you’re wondering what tastes great dipped in pumpkin dip, the good news is: pretty much anything sweet. Fruit like apples, bananas and strawberries are perfect, as are graham crackers, animal crackers and vanilla cookies. 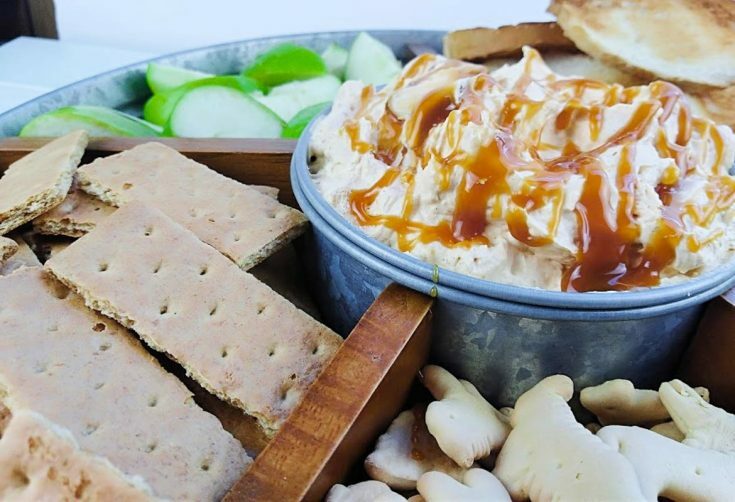 Even a few savory things, like pretzels and crostini, are delicious with this dip! 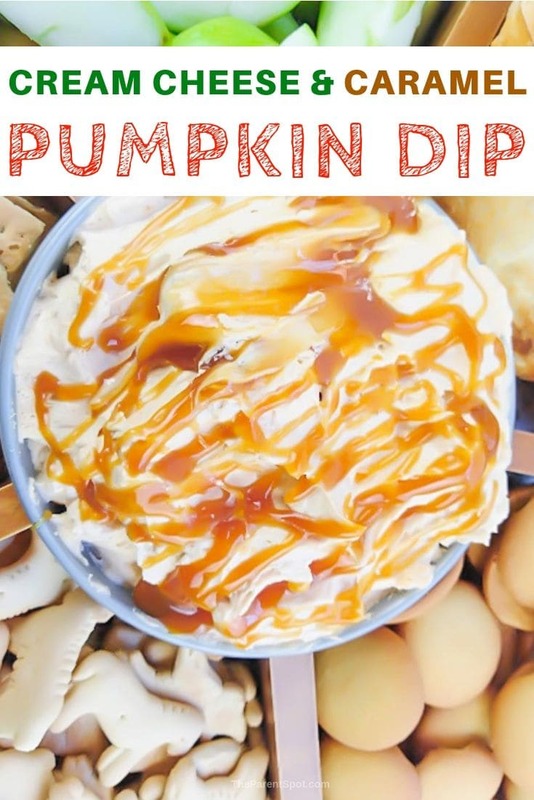 Did you try this pumpkin dip with cream cheese and Cool Whip? What did you think? Let us know in the comments below! Add caramels and heavy cream to a medium saucepan. Cook on low, stirring constantly until they're combined. Cool 15 minutes. Add 1/2 of the dip to a serving dip, and drizzle with 1/2 of the caramel sauce. Top with the other 1/2 of the dip, and drizzle with the remaining caramel sauce. Serve with fresh fruit and crackers. This is going to be a favorite! Can I store this in the fridge? For how long? I’m just so excited to make this. Sounds like the perfect way to fill your sweetoooth cravings.